India is a budget traveler's dream. It's certainly one of the cheapest countries on our itinerary. Our daily budget for two is probably less than you spent the last time you went out to dinner. For the most part we've stuck to it, though we did quickly realize that slight upgrades in train travel, for instance, were worth the additional expense. Train Travel – Personally, we found trains to be much better value for long distance travel than buses. Most backpackers opt for "sleeper class" which gives you a berth that in theory you don't have to share with anyone else and you can lay down if you choose. We took this our first trip and were miserably hot and dirty at the end of our 10 hour journey. We resolved to spend about 3x as much for the comfort of AC. Though it would tip is over budget, it was worth it for we later learned that the difference is not just in having AC, but also in preserving some sanity. No one without a ticket boards the AC car. In contrast, EVERYONE seems to board the sleeper class car – that is until they get into a series of arguments with other passengers who actually have seats and ultimately with the conductor in the middle of the night and get thrown out to the hallway of the carriage where they proceed to camp out on the floor. Neither of us cared to repeat that trip. Accommodation – I hate to beat a dead horse, but it's hot here. And when you're walking around like a stupid tourist in 110 degree heat for hours, it's nice to have some place cool to retreat to. In the humid south, we couldn't find an AC room. Up north, thankfully, it is a bit easier, but also more expensive. We include this additional expense in the "sanity category" with the upgraded train travel. It's worth it, and didn't really push us more than a few dollars over. Mumbai is the exception. All lodging is expensive here, though this time around we found a good deal two floors below the Lonely Planet recommendation. The only downside is that it only has shared squat toilets down the hall. For the comfort of AC, I can sacrifice the toilet. And if I really need to take a seat, I'll walk two blocks down the street to the 5 Star Taj Hotel. Food – If you enjoy the local food like we do, there is really no need to break the budget on food. Major cities and tourist oriented destinations like Palolem definitely charge the gringo price, but the food is still relatively reasonable. Of course, if you want to break the bank, there are places that will help you do so. We probably spent between $3-6 on a meal for both of us. A good masala dosa never costs more than a 50 cents to a dollar at a respectable local eatery. 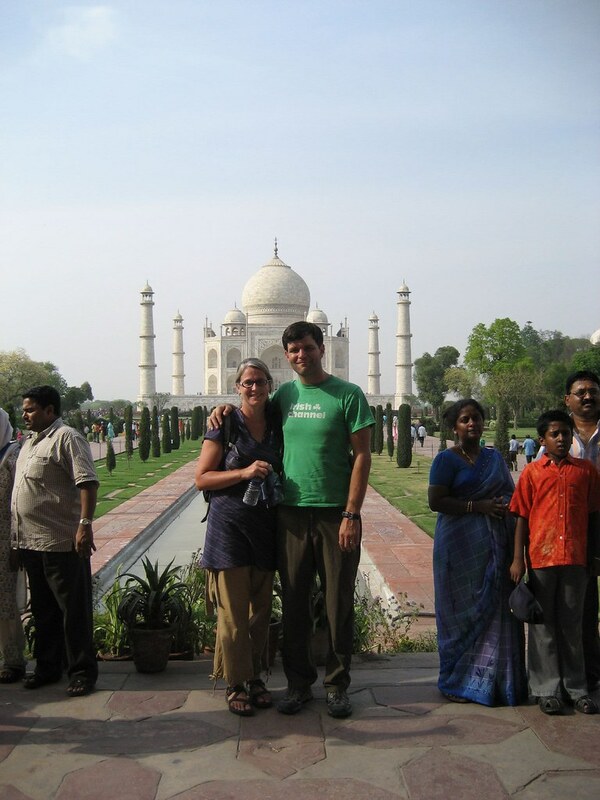 Tourist Attractions – We are tourists and there are things in India worth seeing, such as the Taj Mahal. Though the entry fees are still small relative to what you might pay in the U.Sor Europe, they would easily equal 1/3 to 1/2 of our daily budget. The frustrating thing (though I suppose you make an argument that it's fair) is that Indians usually pay 10 rupees (about 25 cents) for entry into an historical site, while foreign nationals pay at least 250 rupees, which is now equivalent to about $6. Telephone- We ended up buying a local SIM in Goa which had pretty decent rates to call the U.S. Unfortunately once we left Goa, we had increased service fees and received fewer minutes for our value. Still, the calls were better value than the SIM we brought from the states. Email – Keeping up with email and the blog is our connection to home and something we enjoy doing a few times a week. We've had great access throughout most of the country and for the most part, it has been inexpensive costing on on average about $1 per hour. If we're uploading pictures, blogging, catching up on email, etc, we can pretty easily kill several hours in an internet cafe. All told these are really not that hard on the budget, but at the end of the day they did push us over by a few dollars. Though we've managed to get by on $30-35 per day for both of us, that doesn't mean that you can't spend several thousand dollars a day for palatial luxury at a place like Udaivilas in Udaipur. The Kohinoor Suite with private pool has a modest price tag of $3800 per night at peak times. Ouch!